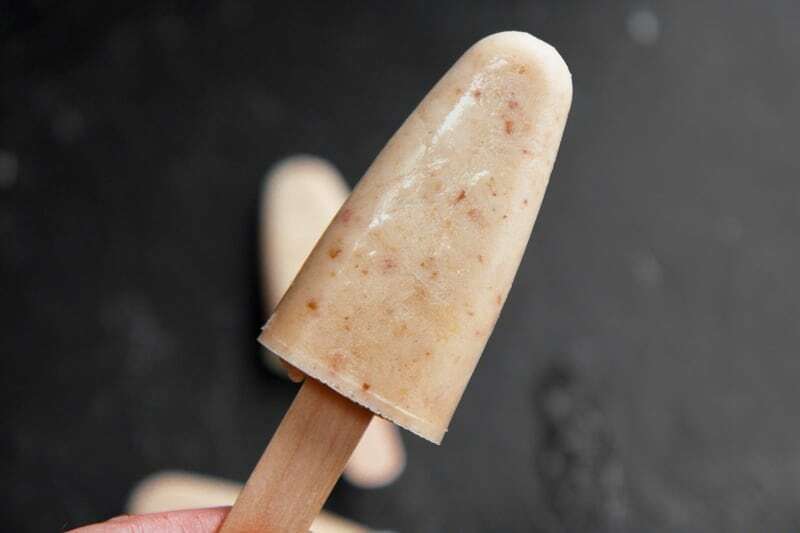 These all-natural yogurt popsicles are a great way to treat yourself to dessert without sending yourself into a sugar coma. Don’t have a popsicle mold? Try freezing these in ice cube trays or paper cups. First things first, a few housekeeping items. You might notice things look a bit different ’round here—these design changes are part of what I was talking about in this post—and there will be more to come! I still have some tweaking to make (like, uh, it’s totally broken on mobile devices, I’m hoping to get to that today), but it’s getting there. Thanks for bearing with me! I’m partnering with a very cool start-up that helps raise money for charity called CentUp. Basically, if you guys are feeling particularly lovey dovey over one of my posts (or just feeling generous on a particular day), you click that CentUp button and are directed to a page where you can donate a few cents to charity. Quite literally, just a few cents—the default donation amount is only $0.05 (although, you do have to load at least $10 into your account—but you can use that $10 a little at a time on any of the sites that are participating in CentUp). The idea of the company is the half of what you donate goes to the author and half goes to charity, but I’ve decided that I want 100% of what is donated to go straight to charity. And right now, any and all money that gets generated from the CentUp buttons on Wholefully goes to the Lynn Sage Foundation to help fund breast cancer research, which you all know is a cause near and dear to my heart. We’ve done some awesome work for breast cancer research together in the past few years (like when you guys helped me and my sisters raise almost $6000 for research! ), and I think this is a new fun way to keep that charge going. I hope you’ll be able to throw a nickle or two toward a good cause. 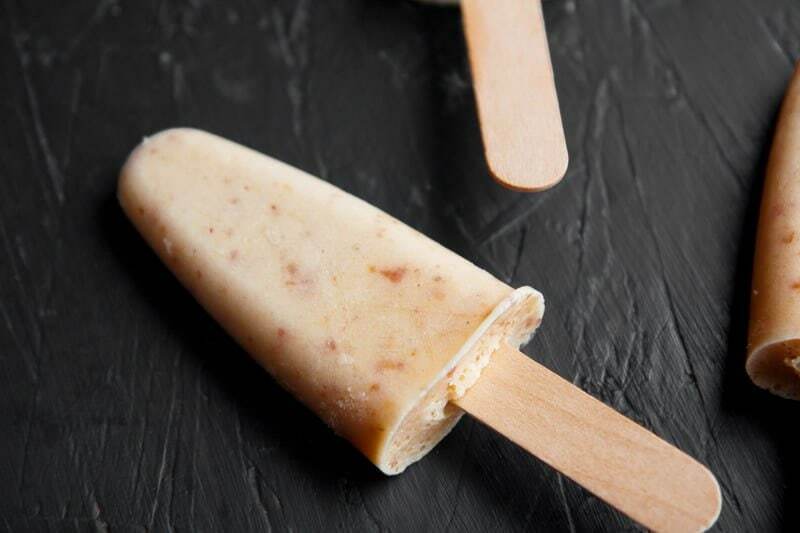 Okay, enough housekeeping—onto banana peach yogurt popsicles! 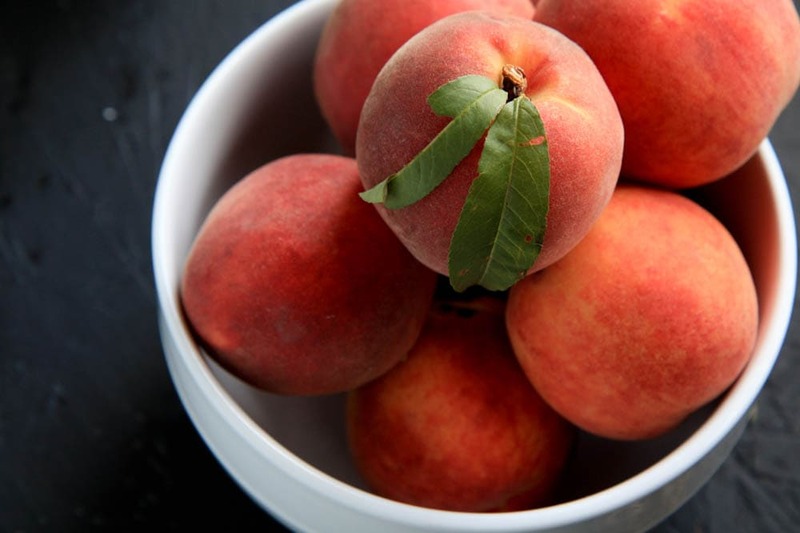 Can you believe we’re still working on the peaches we have stashed in the freezer from last summer? Actually, you probably can, considering we brought home about 100 pounds of peaches after a morning of picking at a local orchard. 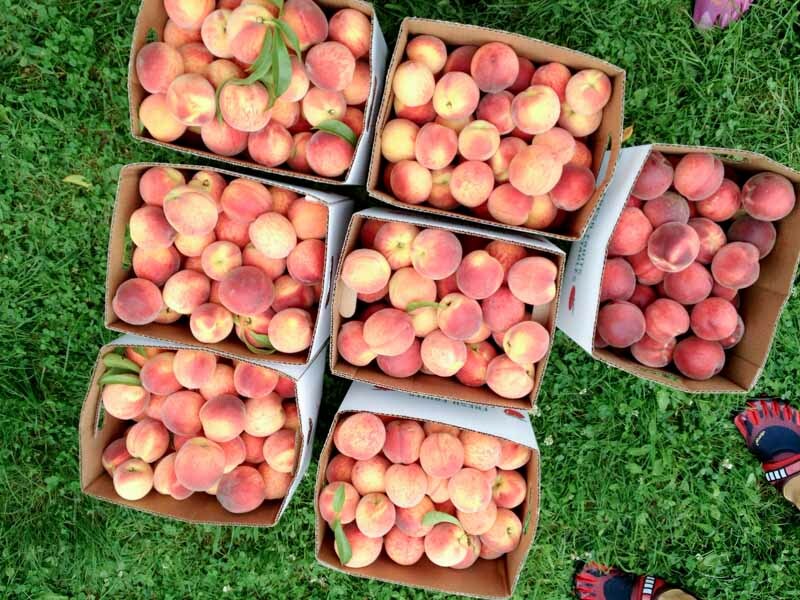 It took about a week full of peach processing to get through all of those back in July. I froze ’em. I made peach salsa. I made peach BBQ sauce. I canned peach halves. I made peach cobbler. I made peach jam. I ate enough fresh peaches that I started to turn orange. And eventually, toward the end of the last box of peaches, I was totally tapped out and just froze some peaches whole. I had no idea what I was going to do with them, but I figured I’d eventually figure out something to do with them. As it turns out, peaches freeze really well whole! Sure, they don’t come out like fresh peaches after thawing, but the peel of the peach helps to retain a lot of the color and flavor of the flesh. And, they’re really easy to work with. I just pull out how many peaches I want, and run them under warm water for a few minutes or just sit them on the counter for a few hours and, boom, thawed peaches! 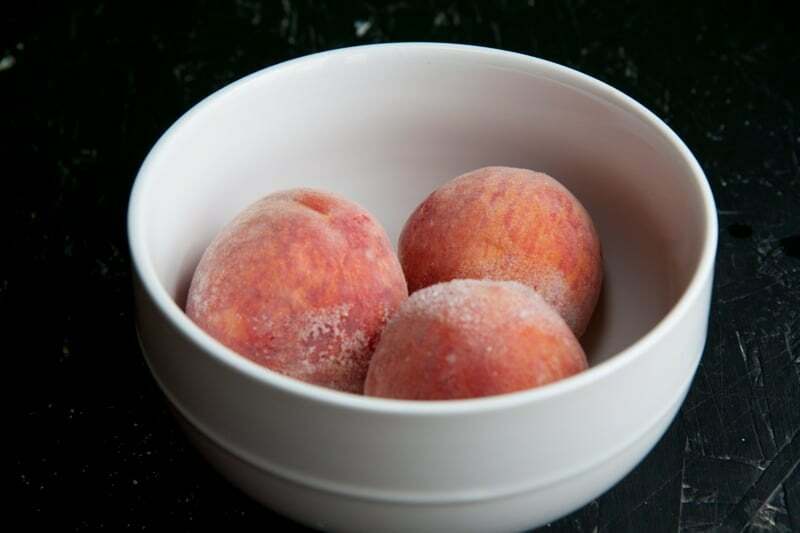 And it’s hard to beat how easy it is to freeze peaches whole. I just washed them, and then threw them into a gallon zip-top bag. So much easier than the blanching, peeling, slicing and pitting that comes with freezing peach slices. 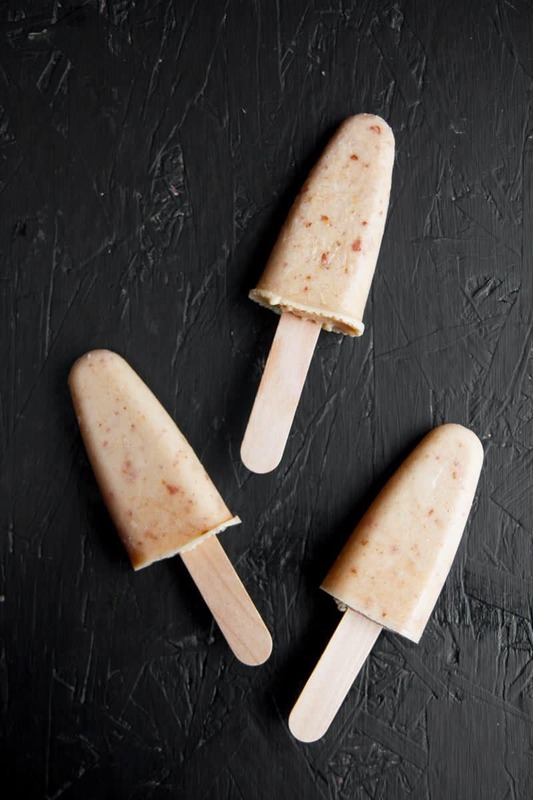 One of the things I’ve been using our whole frozen peaches for lately is yogurt popsicles! I absolutely love making our own popsicles. It’s a nice little after-dinner treat that we can 100% control what’s in it. In fact, I usually just either leave them sugar-less (because the fruit I use is so sweet), or just use a touch of honey, which makes these popsicles dessert-friendly and snack-friendly! I love a good snack that feels like dessert. When I first started losing weight years ago, in order to cut through the sugar cravings, Craig and I would treat ourselves with a popsicle after dinner every night. Mostly they were sugar-free popsicles that were packed with artificial colors, sweeteners and flavors, and while I’ve moved past eating those kinds of foods, I still have a big fondness for a post-dinner popsicle. While the actual product I was using might not have been the healthiest of choices, the behavior I was practicing was really healthy. Denying yourself is never fun! And by gifting myself the simple joy of a popsicle at the end of the day, I was setting myself up for success in my weight loss journey. It’s a philosophy I still follow in my life now, even though I’ve moved way past cheap popsicles and calorie counting. The simplicity of these yogurt popsicles is one of the things that makes me so fond of them. Feel free to tweak and adjust them to get your perfect post-dinner popsicle formula. These all-natural popsicles are a great way to treat yourself to dessert without sending yourself into a sugar coma. Don’t have a popsicle mold? Try freezing these in ice cube trays or paper cups. Combine all the ingredients in the carafe of a blender. Blend on high until very smooth. Pour into popsicle molds and freeze. Once the popsicles are somewhat solid, stick in popsicle sticks, and then continue freezing until solid. First off, LOVE the new header and changes. Super cute!! I love the thought of making Popsicles and totally need to do this. You definitely motivate me to make more of my own foods. Love the new header and design! And as for homemade Popsicles – hands down one of my favorite treats! I love them year-round, but definitely summer time the most (hello, copious amounts of fresh fruit!). Combining fresh fruit and herbs is one of my fave ways to make them :) happy Tuesday! I had no idea you could freeze peaches whole. This is going to be a life saver this summer for me. After canning the 3rd bushel I’m “peached” out. Thumbs are sore from pulling pits and my legs are noodles from standing next to the cutting board. Trying to get my life “in order”, and starting in the kitchen…and I’m so thrilled to see so many of your wonderful posts that make me think I CAN DO THAT! I never would have thought I would get excited about cooking. Bless you! Yay! Honored to see the shiny CentUp button on your blog. Now then…off to make some popsicles. Amazing, I found a gallon bag of peeled, chopped, frozen peaches in my freezer last weekend! I have zero recollection of prepping and freezing them, but they’re there, labeled in my own handwriting from August 2013. Thanks for the the idea to use them in popsicles, I think I’d forgotten about my popsicle molds for the winter (as well as healthy, 10-2 Points Plus after dinner treats that aren’t just fresh fruits).